中央供料系统正是在这种市场需求的背景下发展成熟起来的。 Centralized supply of powder system development is bound to block, the central feeding system is a continuous environmental protection of the central suction system, which is the country compared to a central feeding system. Therefore, the central centralized supply of powder system equipment company also probably catch the opportunity, focusing on skills development with innovation, optimize the company chain, is now the era of knowledge and technology big bang, only scientific and technological progress to keep up with the pace of the times, to adapt to the market demand. Centralized supply of powder system ------ economical and practical, low cost of investment Large central feeding system ------ safe and stable, low cost of the latter low Central suction system Introduction: Central supply system refers to all the cyclone (Or raw material receiving equipment) and vacuum pump and control system through the pipeline and circuit connected. 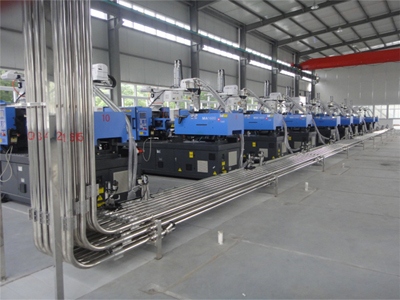 The central feed system consists of a vacuum pump, a raw material drum, a feeder with a vacuum shut-off valve, a molding machine, a raw material line and a vacuum line (some systems also include a central floor dust collector), and a smart control card control system. 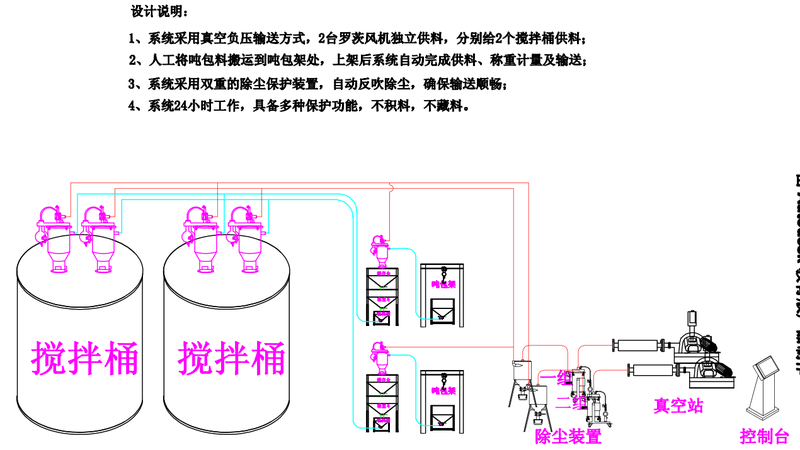 The central feed system allows the feedstock to be dispensed from the specified location through the vacuum line to the forming equipment. Among them, a variety of equipment placed in a certain order to follow: vacuum pump and raw material barrels are always placed in the workshop at both ends, can be separated from the vacuum pump and the raw material barrels of different feeding capacity of each machine to coordinate Consistent. V The straight circuit used does not slow down the feed rate in the line, compared to the piston-type vacuum barrier used, Sanding's baffle-type opening and closing than the piston components durable, no need to replace rubber every three months Pieces. Centralized supply of powder system has the following characteristics: efficient raw materials, dry, color, crushing and recycling materials to achieve a high degree of automation control and monitoring, and can meet the 24-hour non-stop production needs. The fuel supply system is simple to save energy, reduce the amount of labor, reduce the cost of raw materials and auxiliary equipment to provide more space, the application of central processing and reduce the cost of individual equipment to save energy and maintenance costs; personalized according to different users, workshops, raw materials designed to optimize Program; modern factory image to raw materials and dust on the injection molding production area to minimize pollution, and reduce noise, to achieve unmanned automated production. Central feeding system is to achieve the concentration of raw materials, drying, dehumidification, metering, stirring centralized treatment, closed delivery, completely avoid workshop noise, dust, hot air pollution waste material. Centralized supply of powder system has the following characteristics: efficient raw materials, dry, color, crushing and recycling materials to achieve a high degree of automation control and monitoring, and can meet the 24-hour non-stop production needs. The fuel supply system is simple to save energy, reduce the amount of labor, reduce the cost of raw materials and auxiliary equipment to provide more space, the application of central processing and reduce the cost of individual equipment to save energy and maintenance costs; personalized according to different users, workshops, raw materials designed to optimize Program; modern factory image to raw materials and dust on the injection molding production area to minimize pollution, and reduce noise, to achieve unmanned automated production. What is the effect of the centralized supply system?